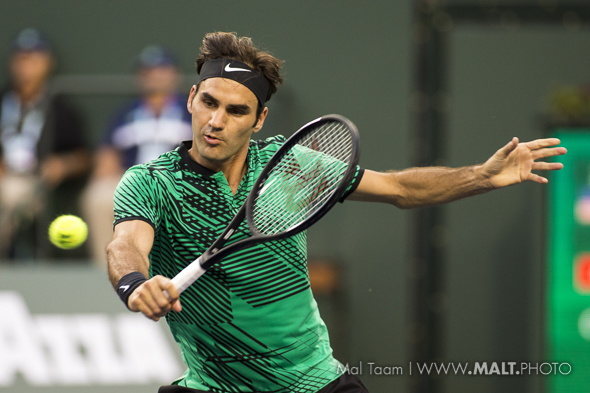 The great Roger Federer will go against the up-and-down Alexandr Dolgopolov on Tuesday. Dolgopolov has an incredible variety, but he is rarely patient and he does not serve hard and move it around in the box. Still, maybe one time, Dolgopolov can play fantastic and on Centre Court he could be very happy and really go for it. Federer knows everything he has to do, and in the first round, he will quiet the monster. Kei Nishikori won over Marco Cecchinato and the Japanese says he can win it all at Wimbledon. On grass? Wow, he thinks that for two weeks, he will not get hurt — again? That would be very unusual. Let’s see. There are times that Stan Wawrinka can play out of his mind, and there are others days he checks out. He was on fire at RG, but on Monday on grass, he lost against the young Russian Daniil Medvedev. Good for Medvedev, but as Wawrinka has said, he cannot play well every week. Clearly, that happened on the first day. Here is a stunner: Aljaz Bedene beat Ivo Karlovic 6-7(5) 7-6(6) 6-7(7) 7-6(7) 8-6. Karlovic can serve harder than anyone, but when they start rolling, he is too slow. Rafa Nadal smoked John Millman, and without a doubt, he is one of the favorites. He has won Wimby before and, as long as he stays healthy, he can knock out anyone. How about Marin Cilic who destroyed Philipp Kohlschreiber? Maybe he can reach the semis at a Slams. Good wins by Kevin Anderson, Donald Young, Sam Querrey, Steve Johnson, and Pierre-Hugues Herbert, who advanced when Nick Kyrgios retired. A surgery coming for Kyrgios? This year, he has not dealt with the doctors. The Roland Garros champ Jelena Ostapenko won on Monday, and we would think that the big basher will continue to feel that she is better than anyone. That is possible. After all, she did shock the world in Paris. Speaking of Petra Kvitova, she is also on fire, winning Eastbourne and on Monday, she won easily. However, she is a little bit hurt already and while she bangs the ball, if she goes very deep, she can panic. Over the past decade, she did. Good wins by Vika Azarenka, Ana Konjuh, Johanna Konta, Dominika Cibulkova and the Americans: Madison Keys, Jennifer Brady and Madison Brengle. How about Genie Bouchard, who in 2014, she reached the final and she was looking very, very good. But now, she cannot get going. She lost against Carla Suarez-Navarro in the third set without a wimper. At this point, you cannot say that she can get back into the top 5. She is so confused. The same thing goes with Laura Robson, who lost against Beatriz Haddad. Is the Britain Robson really loves tennis? I am just not sure. Wimbledon: Who will gain the semis? The No. 1 Angie Kerber can play great at the Slams, but this year, she has fallen down — again. The German is struggling big time, and in the next month, she will be out of No. 1. Last year at Wimbledon, Kerber reached the final, cracking the ball and moving super fast (she lost in the final against Serena Williams, who is not playing the rest of the year), but now, as she has said, she is mentally out of it. So the German will lose pretty early, this week, likely against the good veteran Lucie Safarova in the third round. After that, who can reach the semis? Maybe Garbine Muguruza, who looked pretty good at Roland Garros last month, but she still doesn’t love grass. Aga Radwanska is another one: she has reached the final at Wimby a few years back and she was close to winning the title, but this season, she has done nothing. However, Aga has been injured a lot (isn’t everyone? ), but perhaps she knows she has a real shot to finally win the trophy. She is super smart, but she can get frustrated. This time, though, she will shake her head and get on with it. She will reach the semis, unless the American Laura Davis can dominate her backhand. Here comes Karolina Pliskova once again, who should be No. 1 fairly soon. However, she has yet to win a major yet, so if she wants to become No. 1, she has to push herself— very hard. Pliskova is incredibly powerful, her serve is ballistic and she can touch the lines either way. Her confidence is rising every day, so she should be able to run to the semis. She should out-hit Daria Gavrilova in the third round, and in the fourth round, she will face Caroline Wozniacki (who she just beat her in the final of Eastbourne), the Frenchwoman Kristina Mladenovic, or the American CoCo Vandeweghe. Mladenovic is getting substantially better, so she will lock heads with Pliskova in the quarters. It should be a terrific contest, but once again, the Czech will crack her forehand and reach the semis. Pliskova is ready to dance. This area is very difficult to match. There are some terrific competitors, but on grass, only Venus Williams has won five times at Wimbledon, and right now, the 36-year-old is very depressed. News came out last week about the death of a passenger in a car she hit in Florida. So Venus will be thinking about it every second for a long, long time. Elina Svitolina is favored to reach the semis, but she has to shorten points and rip her forehand. She has become much better at understanding her game and how to adjust to it. She should reach the 4th round and then she will have to go against the new Slam champion Jelena Ostapenko, or the American Madison Keys. Ostapenko is on fire, and she absolutely crushes the ball on clay, on hard courts and on grass. She will overcome Keys, who is hurt constantly. Ostapenko will jump over Svitolina, assuming that the young and very good player Ana Konjuh, will rise up. But it has to be the 20-year-old Ostapenko, who will reach the semis, assuming that she can keep her head in the game. We all know that Petra Kvitova loves Wimbledon, winning it twice. Her first serve twists around, and both her forehand and her backhand is heavy and murderous. Over the years, she can be upset when she is not playing badly, but when she thinks on court, she begins to change, her confidence returns and she beings to smoke the ball. Kvitova won a tournament last week and while she was out for six months, she knew exactly what she had to do. Now, she is one of the favorites once again. She is thrilled to be back. However, it won’t be easy here. Kvitova should be fine in the first week, but after that, the tough competitors will be right there. She might have to play against Brit Jo Konta, which would be spectacular. But Konta is injured and she may not be able to reach the second week. Plus, she has never won a big matches at Wimbledon before. Konta is very driven, but on grass, she isn’t patient enough. Kvitova will take her out and in the quarters, she will have to play against Simona Halep, Elena Vesnina, or believe it or not, Genie Bouchard. Halep is mentally in and out, Vesnina has become more real on singles, and the Canadian has gone deep here three years ago, but Bouchard is totally unpredictable. Regardless who she will play, Kvitova will reach the semis. Her potentially third Wimbledon championship is sitting right there for her. Who to reach the semis: Murray? Federer? Nadal? Djokovic? Wawrinka? Raonic? Kyrgios? Andy Murray is the top seed, but clearly, he has not been playing great this year. Yes, he definitely knows how to win Wimbledon, but he is struggling and he can be mentally confused. Can he actually grab it again? I doubt it, but the No. 1 always tries as hard as he can. He should reach the third round, but then he will likely face Fabio Fognini, who has played very well, but he does not love grass, and Murray will hurt him. In the fourth round, he will have to go up against either Nick Kyrgios or Lucas Pouille. That is almost a toss-up. Pouille is getting better and better, but we all know that when the Aussie is totally on, he can blast it into the corners. Yes, Kyrgios is up and down and he gets hurt frequently, but when he is into it, he can crush it. Kyrgios and Murray like each other, and the Brit knows how to compose himself. However, the Aussie will hit ace after ace and stun Andy. Who will reach the semis here? Maybe Stan Wawrinka, who just reached the final at Roland Garros, but the Swiss has never gone very deep at Wimby. Yet this time, he realizes that he has to move in, rather than going back. Wawrinka will reach the quarters, but in the fourth round, he will have to take down Jo Tsonga or Sam Querrey. It’s all about aces between those two, but this time, Wawrinka will out rally him. Rafa Nadal hasn’t played since Roland Garros, when he won in his tenth title. He is back — finally — and his backhand has gotten substantially better. However, clay versus grass is much different and for the Spaniard to win Wimbledon, he must be quicker and shorten the points. Over the years, Nadal’s body was exhausted after clay. But he looks pretty healthy again, so during the first week in England, he should win pretty easily. However, in the second week on Monday, he will have to face either Ivo Karlovic or Gilles Muller. Both are huge servers, and both love coming into the net. However, they can be a little bit slow, and they don’t move well enough, which is why they have not won a major before. Rafa has — 15 times, in fact. In the quarters, he will have to go up against either Marin Cilic or Kei Nishikori. Cilic is pretty consistent this year, and the Japanese is intelligent, but he cannot contain himself. Cilic will try to paint the lines against Nadal, but his shots be called “out” game after game. Rafa will reach the semis. Roger Federer has won Wimbledon so many times it will make your head spin. He badly wants to go super deep at Wimbledon, and given that he just won Halle, he is ready to climb the mountain. However, in the first round, he will have to play against the tricky Alex Dolgopolov, who has tremendous variety, but deep in the fifth set, he can become nervous and fall down, which he will. In order to reaching the semis, Federer might have to pass two very good competitors: Grigor Dimitrov, who has reached the semis at Wimbledon, and Milos Raonic, who reached the final last year. Yes, the 20-year-old Alex Zverev will win the tournament someday, but he still need to improve quite a bit. However, he is already a fine player. In the fourth round, Federer will face Dimitrov, which should be a classic. It will be five sets, and at the end, the 18-time champ Federer will out-think him. In the quarters, Fed will confront Raonic, who was so close to be winning this event last year. But he could not. Now, the Canadian will hit him as hard as he can. Raonic will jump up and down and reach the semis once again. Novak Djokovic is concerned that he isn’t playing as well as he can, but at least on Saturday, he won Eastbourne, which is better than nothing. As he said, now, finally, he is getting a little bit better so when he walks on to Wimbledon, he will be smiling, rather than smirking. If the 12-time Grand Slam Djokovic can reach the semis, then he will raise up high. But first in the third round, he will likely face Juan Martin del Potro. The Argentine knows how to play him, and at the Olympics, he bested against the Serbian with some gigantic shots. But, this is grass. While it is critical to hit big first serves, del Potro cannot hit his backhand with enough authority, while Djokovic’s backhand is incredibly well. That’s why he will reach the semis, unless Dominic Thiem learns how to play on grass (he did thrash Djokovic at RG on clay) and/or Tomas Berdych wakes up. (The Czech reached the final here in 2010.) Either way, Djokovic will get to the semis. And then, is the question.